By the time the Gallente Federation was founded two centuries ago the Caldari Corporations were already well established in Caldari society. Although not nearly as powerful as they are today, they were still preeminent in Caldari economic life. Shortly after jump gate technology was jointly discovered by the Gallente and the Caldari a little over five hundred years before the Federation formed, the Caldari corporations had started their own interstellar surveying and colonization, separate from that conducted by the Gallente. It was these colonies, kept as a secret from the Gallenteans, that became the source of friction between the Gallenteans and the Caldari, culminating in the latter’s defection from the Federation and an ensuing war between the two races. It all started when a Gallente exploration ship happened upon one of the hidden Caldari colonies. When the Federation Senate learned of this they demanded a full-scale investigation into the matter and that all hidden Caldari colonies should immediately been put under Federation authority. This was too much for the Caldari Corporations, which were already grumbling over increasing Federation interference into their affairs. For the Caldari it was a simple question of losing their autonomy forever by caving in or making a stand right then and there. They decided to make a stand. What made the situation so tense right from the start was the situation on Caldari Prime. Being located in the same solar system as Gallente Prime made the Gallenteans very nervous and, more importantly, a sizeable Gallentean population was living on Caldari Prime. Right after the Caldari defected from the Federation they focused on securing the jump gates leading to their (once) hidden bases, as those bases provided the backbone to the Caldari military infrastructure at that time. At the same time the Gallenteans moved their fleet into orbit around Caldari Prime and started blocking the planet. For the next few days nothing much happened. The Caldari were content to sit by the jump gates, while the Gallenteans were debating how to best negotiate a peace agreement. But the Caldari on Caldari Prime were restless. They found the Gallente blockade intolerable and soon small-scale guerrilla activities escalated into all out hostilities. In the end the Gallente population on the planet had to pay the price for the Federation’s indecisiveness. The turning point came when Caldari partisans sabotaged the glass dome of the Gallente-inhabited underwater city Nouvelle Rouvenor. More than half a million perished. 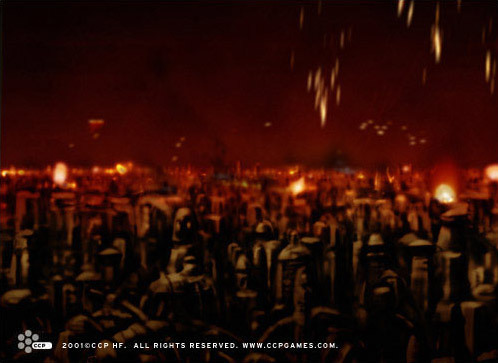 From then on a lengthy, bloody war between the two races was all but inevitable – the Federation retaliated at once by sending an invasion force down to Caldari Prime and began a systematic orbital bombardment of the planet. Soon, the Caldari population had been driven to the mountains and the forests; their resistance getting weaker by the day. The only question was: how would the newly formed Caldari State respond?